I recently swatched my Copic markers and have been getting more use out of them than ever – if you have trouble figuring out which marker blends work best, I highly recommend making blending swatches (using 2-3 markers each time) to get the most out of your existing collection. Here’s another look at the marker ends…the brush nib end has a gray band all around the marker which is missing on the chisel nib end. This is so handy when your markers are front side down because you’ll still be able to tell the two ends apart! I cut the second largest tag shape from the “Cutting Tags” set by Little B and stamped the “Snowy Backdrops” by Lawn Fawn in Hero Arts Unicorn White pigment ink on top of some pool colored cardstock. 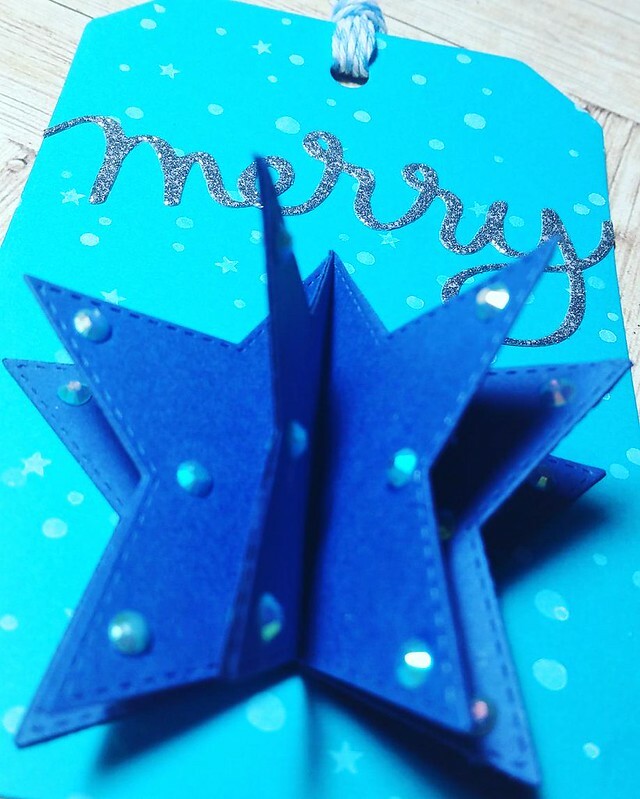 For the star, I used the “Stitched Stars” dies from Gina Marie Designs and cut 5 stars out of bright blue cardstock. 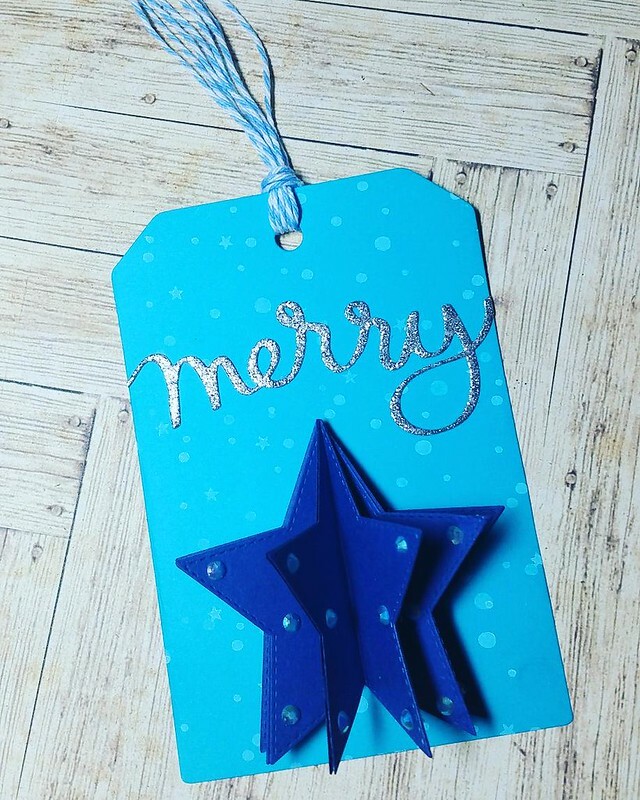 I used strong double sided adhesive to create my 3 dimensional star, but found it difficult getting the stars to adhere completely with tape, so I switched to Tonic Nuvo’s deluxe adhesive. I’ve been using that adhesive ever since I watched Amy Rysavy use it in her videos a few months ago – I LOVE IT! A little bit goes a long way and the tip is narrow enough for most applications without requiring a fine/needle tip. It is much easier on my hands than Ranger’s multi medium in the matte finish. I cut the sentiment using the “Merry” die by Mama Elephant, out of some silver glitter cardstock by DCWV. I then added ice blue gems to my star on the three points on both the front and back sides. I loved that effect so much from Jennifer’s video that I had to recreate it. It makes the most brilliant sparkling effect when the tag catches the light. I finished my tag by tying some blue and white twine through the hole. This is obviously not a tag you can mail but it will look stunning on a gift for someone special. Guess what came in the mail yesterday? My Avery Elle Stamp Storage Pockets! I have been waiting eagerly for them to arrive so that I can get started organizing my stamps and dies. My stamps are still mostly in their original packaging. Before my collection grew to the size it is today, that never bothered me. Now, however, I’m finding that smaller packages get lost in between larger sets and some even fall to the side of the container I store them in, getting lost for months until I empty the entire container. I bought the large stamp pockets and am using those for all sets that are 4×6 or smaller. I did consider getting the small pockets as well, but I have so few “smaller” sets that I just don’t think I will get as much use out of them. I used printable sticker paper to label my dies. I do have a label maker and love using it, but with so many stamp sets to transfer over AND label, I knew printing them all at once would be easier. On my computer, I created a document in Microsoft Word, set my font to Calibri (Body), font size 11. Then, I clicked on “Layout” and under “Columns”, selected three. This meant that after typing up all my text, I would have three columns on each page. Doing this saved me a LOT of sticker paper! Then, I loaded my printer with the printable sticker paper and hit print! Some tips for printing: depending on your printer (I use a low end Canon printer), load 1 sheet of sticker paper at a time. If you have multiple pages, print 1 page at a time. This will save you time and money, I promise. To cut the labels out, I used my Fiskars paper trimmer. I cut off the top and bottom to eliminate the extra space from printing borders. Then, as in the left picture below, I made slits close to, but not past, the edge of the paper. This allowed me to make multiple slits along the rows but not separate the rows…yet. 🙂 I promise…this is another MAJOR time saver. With all the labels cut out, all I had to do was remove the sticker backing, adhere the labels to cardstock and fill my pockets with stamps! I am close to done with my entire stamp stash, and will update with pictures once I’m finished. Today, my craft room is going on tour on my Instagram channel @shakercards ! I will be posting a new picture every hour. While I am lucky enough to have a dedicated room for crafting, my space is on the smaller side, so I will probably only be hosting this series for 6-8 hours. 😉 When the day is over, I’ll be sharing all the pictures here as well. If you’d like to follow along, check out my Instagram page here. Feel free to share your own pictures and tag me in them too! My latest obsession has been making shaker tags. I made the two tags pictured in this post and brought them in to work. My coworker was shocked and said it was an awful lot of time to spend on something most people throw away. When you look at it like that, I kind of agree with her! But they are so adorable, I just can’t help myself. And, I might just gift them with a note that suggests alternatives to tossing them…like hanging them on the Christmas tree or recycling them for next year. The circle shaker was easy to make. The hardest part was trying to fiddle with foam tape to go around the circle. I gave up on the foam tape and die cut 5 more scalloped circles instead and layered them. Problem solved. The rectangle shaker tag was slightly more time consuming because I couldn’t find a die that was proportional to the tag. In the end, I made the shaker portion square and called it a day. The sequins are so sparkly on both tags that I can’t help but play with them and shake them back and forth. 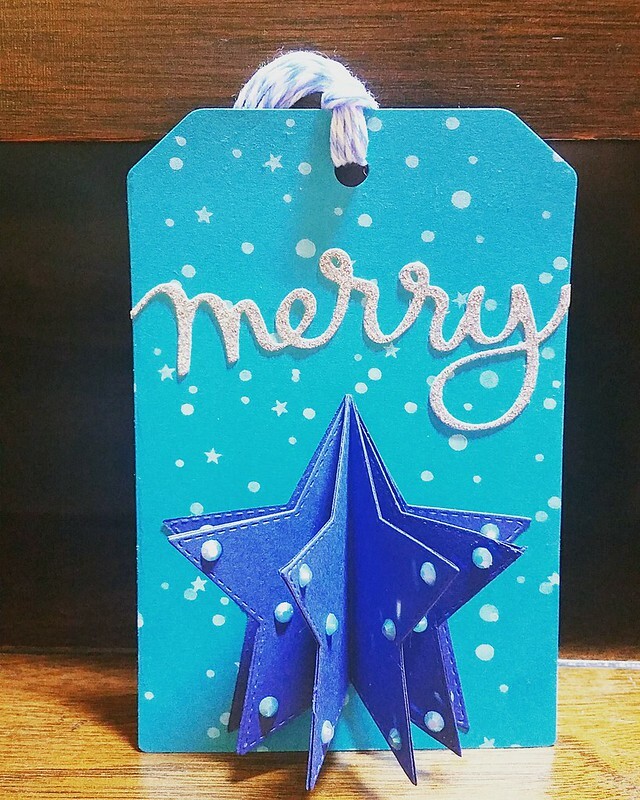 I think I will be making many more of these tags throughout the holiday season – I am already dreaming of a gold and silver microbead shaker! I got some happy mail that made me smile so hard this week! It also happens to be my birthday this week and my family spoiled me by sending me these goodies in the mail. I cannot WAIT to break open these dies and get crafting this weekend! You can’t go wrong with Copic coloring, Lawn Fawn stamped images and cute pattern paper! Lawn Fawn’s images are always fun, adorable and quirky. Their sentiments have the most excellent puns – they never fail to make me smile. The “Fairy Friends” stamp set is part of Lawn Fawn’s Spring 2016 release. When it came out, I had just quit my job and couldn’t justify a craft purchase. It stayed on my wish list till a few weeks back, so, when I got my hands on it, I HAD to make a card right away! I used the “Meadow Border” die for the grass, also from Lawn Fawn, out of some scrap green cardstock. My images were colored in with Copic markers. I am still very much a beginner at using these markers, but once you get past the initial learning curve, it is easy to get good results, even if you aren’t a pro. I used Memento Tuxedo Black ink to stamp my images (because it is a Copic-friendly ink – don’t use Versafine if you plan on coloring with Copics!) on Neenah Solar White 110lb cardstock. I then cut my images out with my Brother ScanNCut as I don’t have the coordinating dies for this set…yet. I then used some polka dot pattern paper from American Crafts (not Lawn Fawn unfortunately – didn’t have any in my stash!) for the background and cut the sentiment (a die I received free from SimonSaysStamp.com in October 2017) out of gold mirror cardstock. Thank you for stopping by and I hope you have a “fairy” good day! Welcome to my blog! I love cardmaking and sharing my creations. To see all the cards I’ve made, click on Card Gallery using the menu on the top of this page. You can also drop me a message by leaving a comment or by clicking Contact on the menu above.